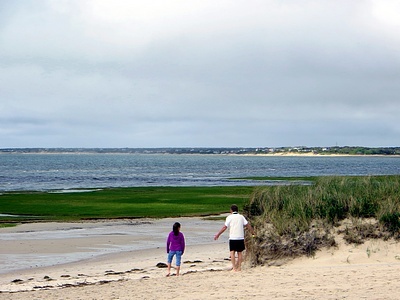 Cape Cod photos: the walk to Skaket Beach and back. Following our visit to Cape Cod Brewery on Saturday morning, and a satisfying pizza lunch, the sun came out. I decided to take a walk. This sign, near the end of the short road leading to our friends' house, pointed me in the right direction. 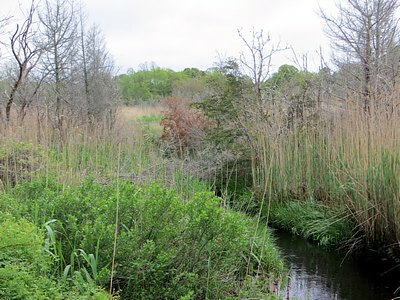 On the way to the beach, the road crossed a stream emerging from a swamp. 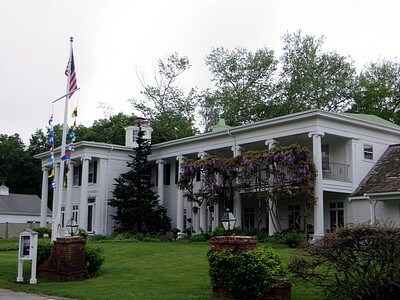 Farther along, I passed the Captain Linnell House, built in the 1850s by a very successful sea captain who, unfotunately, died in a tropical storm off the coast of Brazil before having much opportunity to enjoy it. 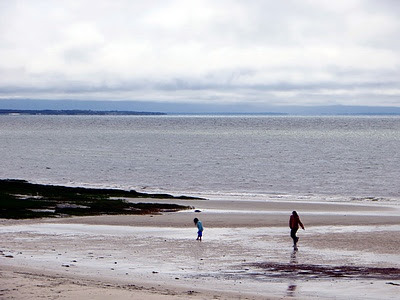 There was a brisk, chilly breeze, and the beach was nearly deserted. This was the view towards the southwest, and the upper arm of the Cape. This was the view to the east., looking toward Wellfleet and Truro. 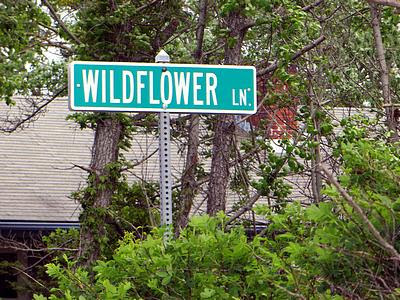 Heading back from the beach, I came to Wildflower Lane. What might be growing there? 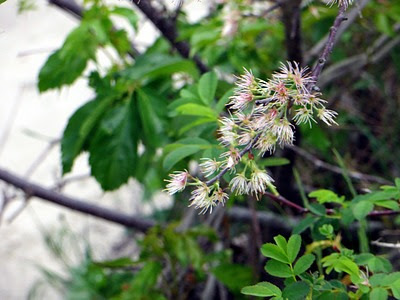 There were these (can anyone identify?). 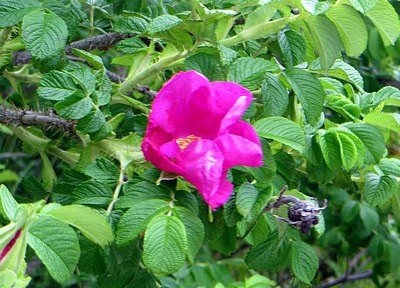 And, there was my old friend Rosa rugosa. 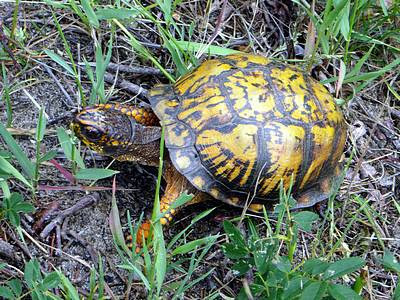 This eastern box turtle had just made it safely across the road. Azaleas were in bloom next to the road. 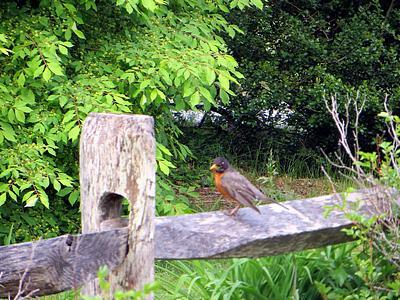 As I approached our friends' house, I saw a male American robin perched on a fence rail. 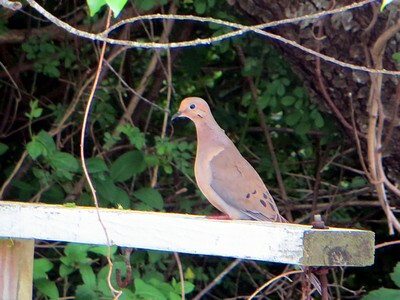 Just opposite our friends' door a mourning dove sat on crossbar. Later we went shopping in downtown Orleans. 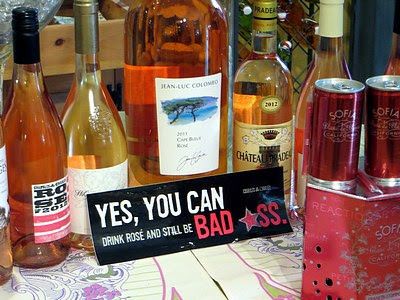 We visited Main Street Wine & Gourmet, where I got this encouraging message. There was good and not so good news last week about two of my favorite musicians. The good news about Lou Reed was that he had a successful liver transplant and is recovering. The video above (based on the credits roll, it appears to have been made at St. Ann's Warehouse, in nearby DUMBO) is of Lou doing one of my favorites of his, "Sweet Jane," originally done with the Velvet Underground, and later on the great album Rock 'n' Roll Animal. The not so good news is about Brooklyn's own Queen of Soul Sharon Jones. I learned through friend Eliot Wagner that she's been diagnosed with cancer. Fortunately, it's been detected at stage one, so the prognosis is optimistic. The video above is of Sharon doing her version of Woody Guthrie's "This Land is Your Land," including the often skipped over "Commie" third verse, and a fourth verse evidently of her own composition. You're in my prayers, Sharon. On our Cape Cod weekend, rainy, chilly Friday begat rainy, chilly Saturday, so we headed down the Cape, around the elbow (see my description of Cape geography in my post about Truro Vineyards) to Hyannis, there to visit the Cape Cod Brewery. In the photo above, Tyler, who conducted our lecture and tasting with knowledge and panache, is approaching. 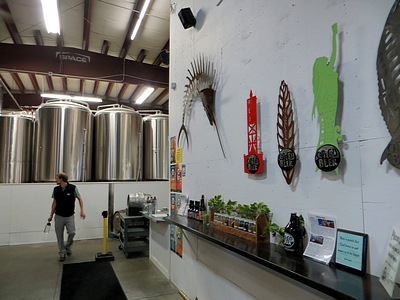 The stainless steel tanks in the background are where the brewing is done. We got an up close look at some brewing ingredients. 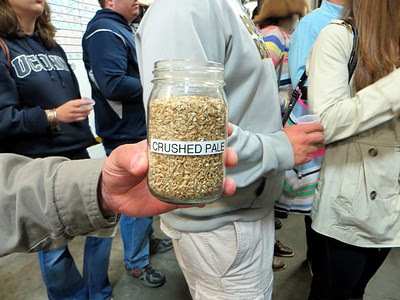 This is crushed pale barley, which gives beer and ale their malt richness. 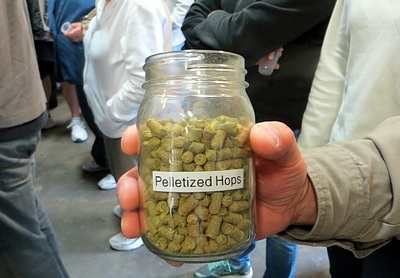 These are pelletized hops, which give the brews flavor. According to Tyler these are Chinook hops, native to the Pacific Northwest. The other two ingredients are yeast, which reacts with the barley to cause fermentation in the presence of the fourth, and most voluminous ingredient: water. "Our local water supply is very good," Tyler said. "We use it, and run it through a big Brita filter." 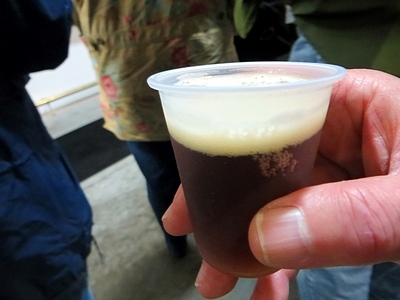 This is one of several brews we sampled. It's the amber ale, which has a deep red color. The brewery calls it "Red Right Return" after the navigational mnemonic that says to keep the red buoys to your right (or starboard) while entering a harbor. I liked it, as I did all of the brews we sampled, which included a blonde ale called "Beach Blonde" which had more flavor than I expected, an IPA, and a porter. Unfortunately, Cape Cod Beer isn't available beyond an eighty mile radius of the Brewery, as it isn't Pasteurized, and has to be kept refrigerated. The next time we're up there, we'll take a cooler chest so we can bring some home. 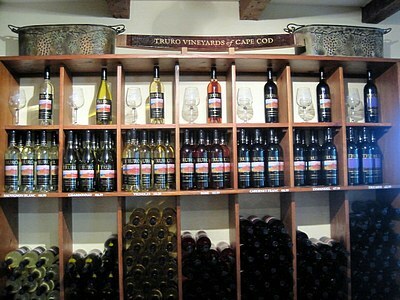 A visit to Truro Vineyards, Cape Cod. 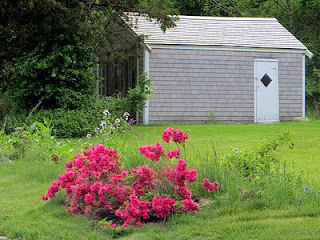 Last summer we visited friends who have a house at Orleans, on Cape Cod. While we were there, I browsed in Main Street Wine & Gourmet, where I bought a bottle of Truro Vineyards' 2009 Cabernet Franc. I wanted to try it on the strength of having recently been impressed by a Cab Franc from the North Fork of Long Island, and reasoned that, if the grape did well in that sandy soil and cool climate, it might do well on the Cape. I wasn't disappointed. Arriving at the Vineyard, we parked facing rows of vines (photo above). Fortunately, the rain had slackened a bit. Going inside, we found a display of the winery's products (photo below). 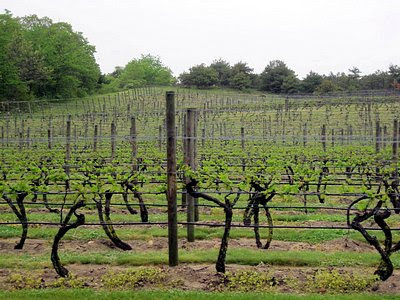 We also source grapes from premium vineyards in Massachusetts, New York and California. This allows us to make a greater variety of wines. Sauvignon Blanc 2012: The tasting menu described this as "[c]risp, light, with hints of grapefruit and pear." The first thing I noticed was the field-of-new-mown-hay aroma that is characteristic of wine from this varietal, or kind, of grape. 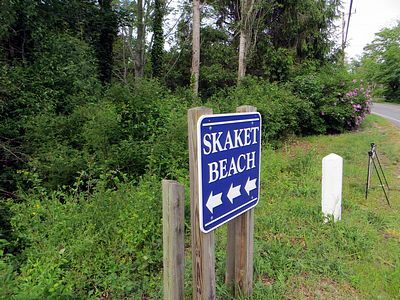 It was very pronounced here, which I took as an encouraging sign. As for taste and mouth feel, I agree that it's "crisp," though I wouldn't call it "light," which to me signifies bone-dryness. This wine has a good balance of acidity and fruit, with definite citrus overtones. I bought a bottle. Chardonnay 2011: The menu said, "Lightly oaked with hints of ripe apple and vanilla." The vanilla comes from the oak, not the grape. My earliest experiences with Chardonnay were of different kinds: very dry, flinty Chablis and Maconnais; and big, buttery, heavily oaked Californians. I liked both for different reasons and at different times. Truro's Chard is an in-between: the oak is noticeable but not assertive, and the fruit--of which "ripe apple" is a fair descriptor--is there, but not overpowering. It's a perfectly pleasant wine, but didn't blow me away. Truro's website also lists an unoaked Chardonnay, which wasn't on the tasting menu. Maybe next time. Cabernet Franc 2011: According to the menu this is Truro's "signature varietal." I can understand why. The 2011 had more tannin and less forward fruit than the 2009 that I tasted and reviewed last year. Perhaps it will benefit from more bottle ageing, or maybe it just hadn't had enough time to "breathe" before it was poured. The 2009 needed some fifteen minutes or so breathing before it really opened up. Still, this is superb wine. I bought a bottle. Zinfandel 2011: This wine is way too sunny to have come from grapes grown on the Cape. Nevertheless, it's a tribute to the Truro vintners' art. It's a big wine, edging on Robert Parker "hedonistic fruit bomb" territory, but it's free of the jammy quality that, for me, mars many such wines. It has tannin and acidity to balance the intense, but not overpowering, fruit. At almost 14% alcohol, it also packs a kick. We bought two bottles; one for ourselves and one as a gift for a friend. Triumph 2011: This is a "Meritage" blend of Cabernet Sauvignon (64%), Merlot (29%), and Cabernet Franc (7%), described on the menu as "big" and "bold." Perhaps I was suffering tasting fatigue by the time it got to me, or perhaps the assertiveness of the pure Cab Franc and the Zinfandel numbed me to its subtleties, but it seemed almost timid to me. Not bad, not unpleasant; indeed, a very drinkable wine. But anything called "Triumph" should make me want to jump up and shout. This didn't. Truro's 100% Merlot wasn't on the tasting menu when we were there. I hope to try it next time. To my surprise, my wife, who usually disdains any white wines that aren't dry as the Sahara, elected to try Vignoles, described on the tasting menu as "semi dry." She offered me a taste. I liked it, as did she. As the website suggests, it would go very well with spicy food. We bought a bottle. On the way out I looked to the right and got this shot of the remainder of Truro's five acres of vines. 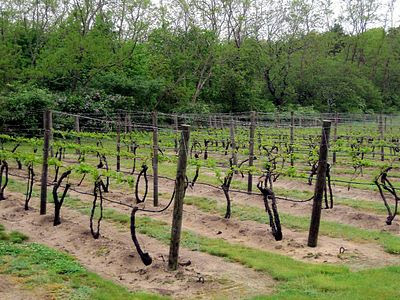 Truro offers free tours of its winery at 1:00 and 3:00 p.m. every day from Memorial Day to Labor Day. Next time I'll take one. I wish Truro could produce wine from at least one varietal (maybe they already do this with Cab Franc, Chardonnay, or Merlot) entirely from their own vineyard. If so, I could write knowingly of the Truro terroir. Meanwhile, all I can say is, the wines are well worth trying, and sometimes much more so. I'm looking forward to a Truro appellation d'origine contrôlée. Update: I've been advised (see comment) that Truro now offers an Estate Grown Chardonnay, made completely from grapes grown in their own vineyard at Truro. This summer they will release Estate Grown Cabernet Franc and Estate Grown Merlot. I'm eager to try them.